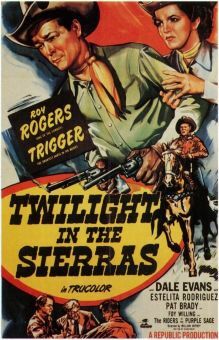 Opening with a brief look at Republic Pictures' back lot in Studio City, CA, this average Roy Rogers songfest settles down to weightier matters after Roy returns to the old homestead to perform a radio broadcast. 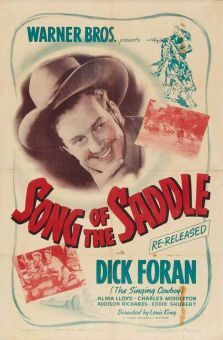 Peace and quiet, however, are rudely interrupted when someone kidnaps the cowboy crooner's famous horse Trigger and demands a $100,000 ransom for the handsome equine. 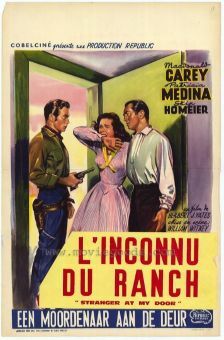 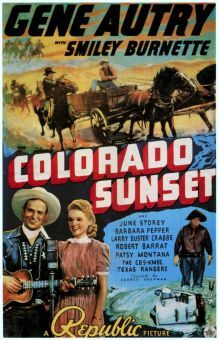 The perpetrators of this dastardly deed are horse traders "Pop" Jordan (George Lloyd) and Lige McFarland (Wade Crosby), who employ a mole at the Rogers outfit in the person of young Ted Conover (Michael Chapin), Lige's innocent stepson, who will do anything to recover the imperiled Trigger. 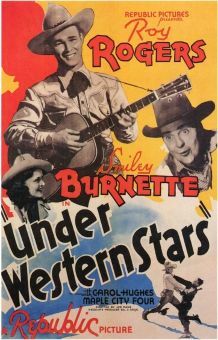 When not chasing down nasty kidnappers, Roy Rogers, Bob Nolan and The Sons of the Pioneers (featuring Pat Brady) and leading lady Jane Frazee perform "Under California Stars", "King of the Cowboys", and Little Saddle Pals", all by Jack Elliott. 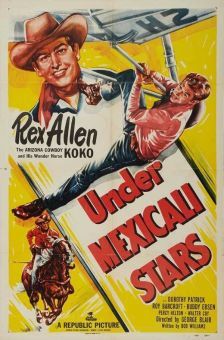 Like he had in his initial Republic starring vehicle, Under Western Stars (1938), Roy also sings Gene Autry's dramatic "Dust". 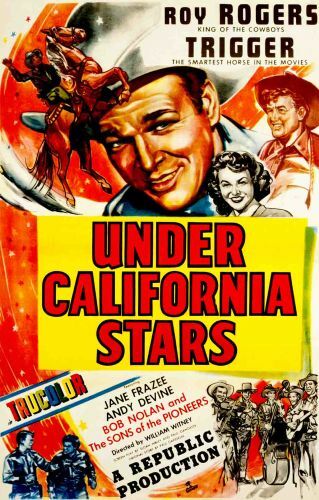 Under California Stars was released in Trucolor.